The key to enjoying your Hardwood Flooring is proper maintenance. The No-Maintenance hardwood floor does not exist. Preventive maintenance is the most important requirement to the long-term performance and natural beauty of your hardwood flooring. The following will outline some preventive maintenance points as well as discuss the basic maintenance steps for the top finish. Use protective walk off mats at the exterior doors to help prevent sand and grit from walking on to the floor. Install proper floor protectors on the furniture used on hardwood floors. Protectors will allow chairs to move easily over the floor without scuffing. Clean the protector on a regular basis to remove any grit that may have become imbedded. Vacuum regularly. When the household carpets are vacuumed, vacuum the hardwood floor with the rotating brush turned off – a brush attachment works best. Sweep on a daily basis or as needed, but do not use household dust treatments as this may cause the floor to become slick or dull the finish. Never wet mop a hardwood floor. Excessive water causes wood to expand, possibly damaging the flooring. Finishes are to protect the stain and face of the wood. They are not bonding or waterproofing products. Keep high heel shoes in good repair. Heels that have lost their protective cap, thus exposing the fastening nail, will exert over 8,000 pounds per square inch of pressure on the floor. That’s high enough to damage hardened concrete. 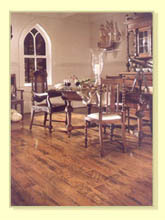 Natural oil floors periodically need to be buffed and re-oiled. Preventive maintenance is the primary maintenance procedure. Food spills should be cleaned up in a timely manner using a hardwood floor cleaner that is appropriate for your specific flooring. Complete re-coating should be done, when necessary, when the floor begins to show wear. Do not wait until the finish is worn off or dirt and spills have penetrated the wood. Waxing is neither necessary nor recommended. Once you wax a urethane floor, it is difficult to re-coat the floor, as the new finish will not bond to wax and the floor. By following these simple guidelines, you will enjoy your hardwood flooring for many years.